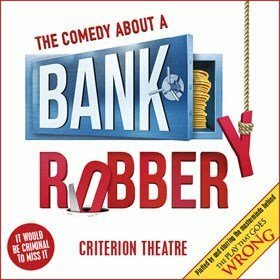 Go down to the Criterion Theatre, take your seat, sit back and be prepared to be astounded by this non-stop, hyperactive, pun-fest of an uber-farce played to destruction by a cast which is in constant danger of being arrested for riotous assembly. In fact, last night saw the arrival of the new cast – the show premiered in March 2016 – and the transition was as seamless as a onesie and begs the question: “Can there really be more than one team of such anarchic, unruly, uproarious pranksters intent on splitting your sides?” The answer is a resounding “Yes!” as the new cast, talented as they all are, inhabit an exquisite framework constructed with care, devotion and attention to the finest detail, which constitutes the raison d’être of Mischief Theatre and its indomitable writer/creators Henry Lewis, Jonathan Sayer and Henry Shields. In the new cast, we have Miles Yekinni as Cooper: this guy has comic timing to die for and an expression of blank amazement at his own incompetence that becomes so endearing that the snowflakes behind me let out cute-cat-video “Ahhhs” when he is about to get… (no spoilers, please, ed.) Tania Mathurin as Ruth Monaghan is soothingly belligerent and has a great voice for the Gospelesque numbers that pop up every now and then and Steffan Lloyd-Evans as her son, Sam, has such an ability to wring every last iota of mirth out of any given farcical situation that I am convinced he must have been raised on a dairy farm. The highly inventive direction of Mark Bell, assisted by Nancy Zamit, ensures that the modern actor doesn’t just need to combine their acting skills with singing and dancing but also requires SAS-level circus skills as well: Gareth Tempest (Mitch) and Hannah Boyce (Caprice) dangle unnervingly at the end of ropes over the stage as the heist reaches its plausibly improbable denouement and with defenestrations, air-conditioning conduit escapades, human closet-stuffings, unexpected bed-flips and the extraordinary sight-gag of the actual physical representation of a ceiling-eye- view of the bank – from an audience perspective – give the whole experience the discombobulating feel of theatrical MMA on ketamine. Christopher Pizzey (Officer Tom Smitties), Mark Hammersley (Warren Slax) and Sean Kearns (Robin Freeboys) lend their outrageously adept comedic talents to the preposterous scenario and Jeremy Lloyd, survivor from the original cast, plays Everyone Else in a suitably shambolic OTT fashion and is the glue that ensures that everything falls apart. carefree, unabashed, urban America the mischievous thought crosses the mind that maybe Donald Trump saw this show and, hankering for a long-gone American idyll, based his whole administration on it. There are a wealth of set-piece running gags centering around giant moustaches, surrogate trouser-less bank managers and Hitchcock-inspired attack-gulls accompanied by wall-to-wall jeu-de-mots all delivered with delectable panache at break-neck speed. For the audience, there’s not a moment’s respite. We chortle and scream, we cackle and squirm, we hoot, we howl and we are ultimately convulsed. Go see it: you will laugh all the way to the bank.